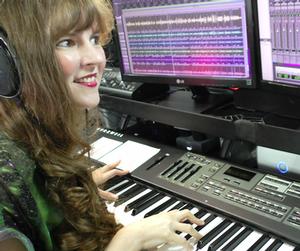 Winifred Phillips is an award-winning game music composer with more than 11 years of experience in the video game industry. Some of her famous video game credits include six games in the LittleBigPlanet franchise (including LittleBigPlanet 3), Assassin's Creed Liberation, Total War Battles: KINGDOM, The Da Vinci Code, God of War, Speed Racer, Shrek the Third, and Spore Hero, among many others. Phillips is the author of the acclaimed bestselling book, A COMPOSER'S GUIDE TO GAME MUSIC (The MIT Press), which won a GMA Book Award Gold Medal from the Global Music Awards, a National Indie Excellence Book Award for the genre of Performing Arts (Film, Theater, Dance & Music), a Nonfiction Book Award from the Nonfiction Authors Association, and an Annual Game Music Award from Game Music Online in the category of "Best Publication." Phillips' book was described by The Boston Globe as "the first book designed to help experienced musicians brave the transition to the world of game composing." Her book was hailed by Sound on Sound magazine as "partly educational and partly inspirational... a great introduction to this specialist art." Music Connection Magazine added that "Phillips' hands-on insights and advice make this one a keeper," and Film Score Monthly praised the book as "a touchstone academic achievement." As a game music composer, Phillips has received an Interactive Achievement Award / D.I.C.E. Award from the Academy of Interactive Arts and Sciences, three Hollywood Music in Media Awards, six Game Audio Network Guild Awards, three Global Music Awards, an IGN Best Score Award, a GameSpot Best Music Award, a GameZone Score of the Year Award, a GameFocus Award, and three Gracie Awards from the Alliance of Women in Media. She has released fifteen albums. Her soundtrack album for the Legend of the Guardians video game was the first video game soundtrack album released by WaterTower Music, the world famous film music record label of Warner Bros. Pictures. Phillips has been profiled in books such as Keeping Score by Tom Hoover, Cash Tracks by Jeffrey P. Fischer, and in Music Connection Magazine, which described her as a "Superstar of video game music."